Bottled water products are normally categorized according to the source of the water and the method(s) used by the bottler to treat it. Bottled water products are required to undergo disinfection. Bottlers who obtain water from a source which has not previously been disinfected, such as a spring or well, will usually use ozone or ultraviolet technologies to disinfect the water, as these processes do not normally leave a residual taste or odor in the water, like chlorine does. Bottled water companies can also purchase their source water from an approved potable water source, such as a municipal water supply. Some bottling companies choose to further treat their bottled water products, using treatment processes such as filtration, reverse osmosis, or distillation. Although federal laws do not require the bottler to list any naturally occurring compounds on the product label, such as sulfates, sodium, or radon, if a bottler chooses to add any ingredients to the water, such as minerals, fluoride, or flavorings, this must be stated on the label. Any naturally occurring or added ingredients cannot exceed the maximum levels permitted by the applicable FDA or state regulations. The FDA has established "Standards of Identity" for bottled water products sold in the U.S.
Artesian well water. Water from a well that taps an aquifer--layers of porous rock, sand and earth that contain water--which is under pressure from surrounding upper layers of rock or clay. 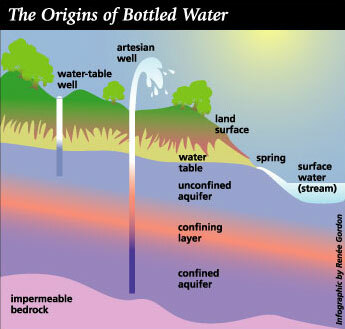 When tapped, the pressure in the aquifer, commonly called artesian pressure, pushes the water above the level of the aquifer, sometimes to the surface. Other means may be used to help bring the water to the surface. According to the EPA, water from artesian aquifers often is more pure because the confining layers of rock and clay impede the movement of contamination. However, despite the claims of some bottlers, there is no guarantee that artesian waters are any cleaner than ground water from an unconfined aquifer, the EPA says. Well water. Water from a hole bored or drilled into the ground, which taps into an aquifer. Bottled water may be used as an ingredient in beverages, such as diluted juices or flavored bottled waters. However, beverages labeled as containing "sparkling water," "seltzer water," "soda water," "tonic water," or "club soda" are not included as bottled water under the FDA's regulations, because these beverages have historically been considered soft drinks. Bottled water that has been treated by distillation, reverse osmosis, deionization or other suitable process and that meets the definition of "purified water" in the HYPERLINK "http://www.usp.org/" U.S. Pharmacopoeia can be labeled as "purified water”. Distilled Water - Water that has been vaporized into steam, then cooled to re-condense it back into water. The water's minerals are left behind, leaving only pure tasting steam-distilled water. 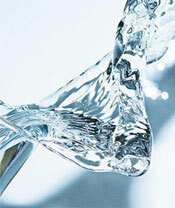 Distilled water is defined as a process by the FDA and not an end product. Creekside actually utilized RO purified water as a source for its distillation units. The distillation typically produces a product with a TDS of less than 10 parts per million and can produce a TDS of less than 1 ppm depending upon the distillation equipment and source water. This type of water comes from an underground formation from which water flows naturally to the Earth's surface, which in the case of Creekside is our approved natural springs. This water must naturally flow to the surface of the surface and there are specific state by state regulations associated with both the development and use of spring water for public consumption. Both the TDS level and mix of inorganic compounds in spring water provide each spring a distinctive “taste’. These TDS components must be individually less than maximum detectible levels as dictated by the FDA to be permitted for public consumption. As each spring has a different “taste”, the source of spring water must be included on the product label. Enhanced waters entail any still water, be it purified, distilled or spring, to which some ingredient or additive is added to the source water. One of Creekside’s most popular enhanced water is fluoridated water. This type of water contains fluoride added within the limitations established in the FDA Code of Federal Regulations as well as guidance from the American Dental Association. This water is primarily marketed as "For Infants" or "Nursery" water. Additionally, the majority of Creekside’s co-packing relates to the bottling of enhanced waters targeted to specific consumer groups. Current offerings include natural flavorings, electrolytes, minerals, and caffeine as additives for our various customers.